Outraged Muslims are demanding Nike recall an 'offensive' line of trainers because the logo looks like Allah's name in Arabic. Saiqa Noreen launched a petition to pull the Air Max 270 shoe and has accused the sportswear giant of 'blasphemy'. The petition, which has gained more than 6,000 signatures in just hours, blasts Nike for allowing God's name to be 'trampled, kicked and become soiled with mud or even filth'. 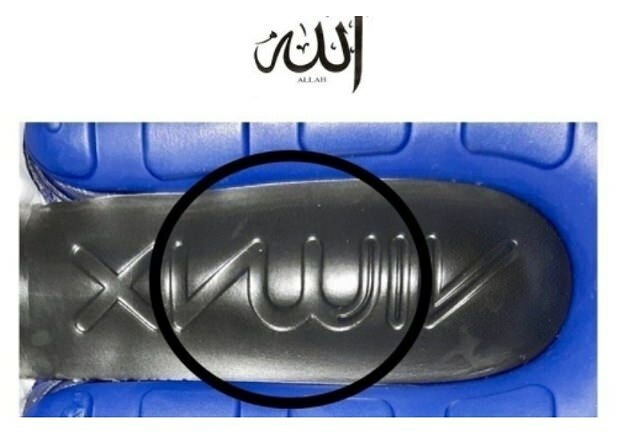 HoratioTarr wrote: Outraged Muslims are demanding Nike recall an 'offensive' line of trainers because the logo looks like Allah's name in Arabic. Maybe they should stop looking at it from upside down then.....when turned the right way up it spells out Airmax. They should just concentrate on more pressing matters and stop worrying about training shoes. Thousands of Muslims need to grow up. Ironically if they’re fake trainers it’s most likely Muslims selling them in the first place! The Puzzler wrote: Ironically if they’re fake trainers it’s most likely Muslims selling them in the first place! There is some truth in that, especially round the N/W markets. Eilzel wrote: Thousands of Muslims need to grow up. And also get it through their thick skulls that the British Head of State is also Supreme Governor of the Church of England and Defender of The Faith, which means that this is historically Christian country that also happens constitutionally to protect the absolute right of individuals to choose to follow any religion or, indeed, none at all. I wonder how many Muslim countries and their Islamic governments are so magnanimous? These protesters may well be offended by the thought that an inscription on a shoe might appear to resemble the name of their God, but even if it did so it would not be blasphemy so far as our laws are concerned. I know the above comment sounds very unPC but he's right. You'll find most asian run market stalls selling copies of this stuff. And also white guys? I mean, a conman is a conman. They come in all colours. Is there a special logo for "Don't do it" ? The famous Nike uptick - with a diagonal red cross superimposed on it perhaps? Two symbols with opposite meanings fighting each other lol.